We will first use setVariable() method of StandardEvaluationContext class, which is used to set/define new variables with values in a context of an object. Next, these variables are used in the String expressions, using #VariableName syntax and are passed to the method parseRaw() of SpelExpressionParse class, which parses the variable in String expression and returns an expression in the form of an object of SpelExpression class. Lastly, we will call getValue() method of SpelExpression class, which evaluates this expression in the provided context and return the result of evaluation. i.e. it gets the result of expression and sets the property associated with the object(being evaluated) with the value of the variable. Let's see an example explaining how to define some new variables and use their values to set the values of the properties of a class, using Spring Expression Language(SpEL). A String property named - name. A primitive int property named - telNo. A primitive char property named - positionGrade. A primitive float property named - yearsOfExp. A static String property named - message. Besides this, we are also going to define a couple of getter and setter methods for these properties. Next, we are going to create another java class named - Utility. We have used StandardEvaluationContext class which evaluates an expression in the context of an object of Employee class. Next, we have called setVariable() method of StandardEvaluationContext class, which is used to set/define new variables with values. Lastly, we will call getValue() method of SpelExpression class, which evaluates this expression in the provided context and return the result of evaluation. i.e. it gets the result of expression and sets the property associated with the object of Employee class(being evaluated) with the value of the variable. Project Folder - SpELVariables is the name of our Project and it is a top-level directory. A POJO class named Employee.java. 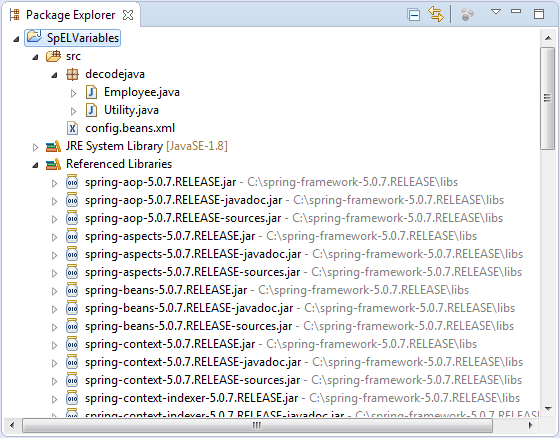 Finally, after executing Utility class, you will get the following output within the Console window. Message for employee : Best of luck! This output shown below, shows the values of properties associated with an object of Employee class. These properties were set with the values of variables created using Spring Expression Language(SpEL).